I love historical fiction. There are a few time periods that I really, really love... and historical fiction involving biblical events is a recent addition to that list. 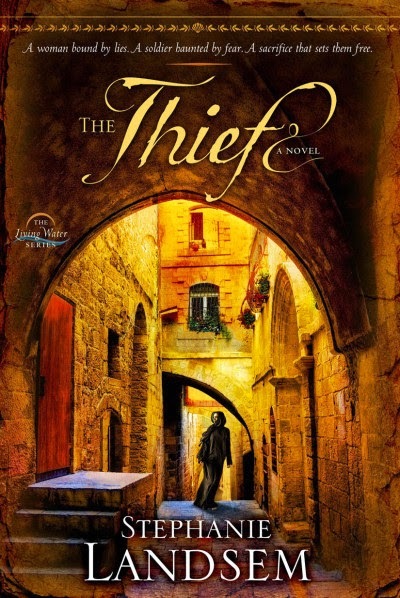 The Thief: a Novel by Stephanie Landsem intrigued me. A story involving absolute nobodies (and some almost nobodies) at the time of the crucifixion, and the changes in their lives as a result of encountering real hope. If you've read other book reviews I've written, you know I tend to be someone who picks up a book intending to read just one chapter, and I don't set it down until it is done. While this book did not quite do that to me, initially, it is still a book I highly recommend. The slow start gives time for plenty of solid character development, and the amount of research Landsem had to have completed is also apparent. It does really feel like you've been transported to Jerusalem. One concern I always have with historical fiction that includes major real people as characters (you know, like Jesus!) is whether or not their interaction with the fictional characters is at all believable. Many books I do actually enjoy still have totally unrealistic encounters between characters and real, historical people. It is much better, however, when I'm reading along and the characters encounter real people and I just keep reading without thinking, "Yeah, right." And that made The Thief more fun to read. I wasn't rolling my eyes at the unlikely coincidences. Stephanie is hosting a Kindle Fire HDX and book giveaway at her website. CLICK THE BUTTON to find out more and enter to win. Sounds neat! I love these kinds of stories....will check it out.